In the peculiar situation of our planet where the scientists depict every day always more catastrophic sceneries, the artist can't do anything else but trying to call back in the memory of his contemporaries that episode of the Bible which tells about Noah and his sons at the mercy of the waves after the Deluge of forty days and forty nights. Saskia Boddeke gets inspiration from the biblical episode of the book of Genesis, but we do not know whether the new Noah's Ark will appear on the water before or after the deluge, rather - as in the book of Genesis - the Ark reminds us an extraordinary event which twists our Blue Planet: an event ruled by God but which originates from human behaviour A new deluge hangs above/over our head: do human beings provoke the deluge or is it still a divine punishment? Or will the Ark be a symbol of a humanity, which has finally understood the need for a deep change in his wicked behaviours? The artists cannot give answers but they can raise a number of questions to which everyone will be able and - will have - to find his own answers. The myth of the Deluge and of the Ark does not only belong to the western culture. In Greek mythology Deucalion, was a son of Prometeus and he survived together with his wife to the anger of Zeus, who put an end to the Bronze Age with the Deluge. The myth also appears in the sumeric culture, which goes back in 2900 BC and also in the Hindu culture: King Satyavata, known as Manu, who survived to a great flood building a big ark in which he had hidden the seeds of life to repopulate the earth. The myth of deluge and of the Ark also appears in Gilgamesh, and in the culture of Americas, and Asia, in China, in Indonesia and even in Polynesia. Any myth - and so any other image - can connect in a most powerful way the destiny of the Man and of Planet Earth as the myth of the Ark and of the Deluge. 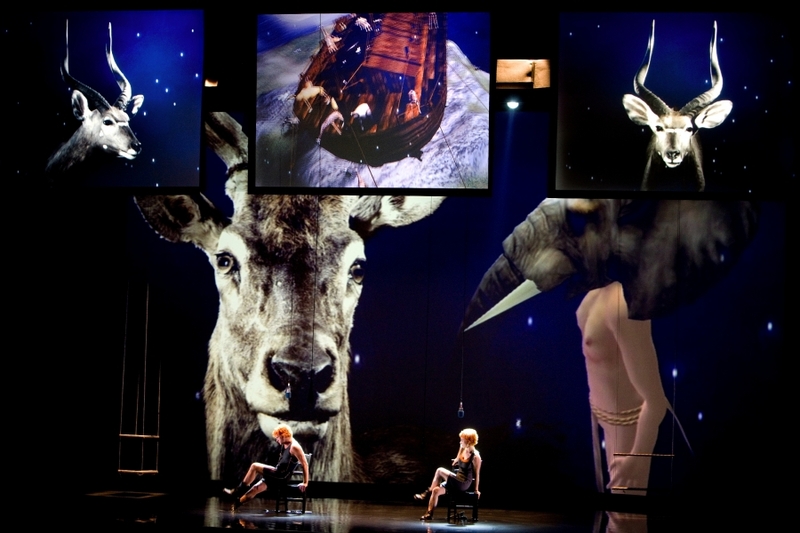 The performance conceived by Greenaway and Boddeke has the shape of a modern multimedia oratory, which blends the art of the actor, the singing and live music with modern technologies: high definition images which reproduce aspects of reality, but even a God and a Noah who meet and talk to each other in a virtual way which seems to be very similar to Second Life. On stage alternate as main characters Noah's wife and two of her three sons: the performance proposes a liberal and anachronistic recreation of the myth, even if languages which mingle - Castilian, English, French and Italian - surely remind of ancient texts which suggest that Noah's sons are the progenitors of all peoples of our planet. One of the most revolutionary aspects of this performance is the irruption on stage of new digital technologies, which give the chance to "orchestrate" the performance in real time. Visual sequences on five different screens and live music are not rigorously organized in a mechanical flowing, but they are rather recalled by the actors, who become as modern VJ. The surprising artistic solutions of The Blue Planet give the chance to take an important step forward to go beyond the borders between cinema, theatre and new technologies of digital images.